If there’s one thing to look forward to during the holidays, it’s the food. And as much fun as it is to cook and bake in your favourite Christmas pyjamas, there’s an undeniably special vibe at the restaurants who celebrate the season with special menus. Whether you’re looking for a festive lunch destination, a memorable Christmas Dinner or a special New Year’s Eve feast, these “To Die For Restaurants” are ready to sparkle. In the heart of downtown within Hotel Georgia, Hawksworth, arguably Vancouver’s best restaurant, is serving Christmas breakfast from 8am to 10:30am and then dinner, from 5pm, with their full a la carte menu and Holiday Tasting Menu available. Their sparkly white, chandelier-adorned room is always festive, so you can be sure it’ll be an excellent backdrop for a special meal. Throughout December, Forage is offering a festive Christmas lunch every weekday. This West End locavore eatery is also open on the big day itself, serving breakfast, brunch and dinner on December 25th. Good Wolf is offering not one, but four set menus to choose from this December, as well as a four-course “Noel Menu” on Christmas Eve for $60. The feast includes a glass of sparkling Summerhill Cypes, a carving station (garlic-stuffed roast beef) and a dessert sampler platter. Enjoy one of the best views in the city while indulging in Christmas Lunch at Grouse Mountain’s fine dining destination. Christmas lunch is offered every weekday till December 23rd at Robson Street’s second-level Italian hotspot. You can also ring in the New Year at CinCin; guests dining at 8:00pm and onwards can enjoy a DJ, a glass of bubbly and, of course, a countdown celebration for $50. Starting on December 8th, enjoy Christmas lunch on weekdays through to December 20th at Yaletown’s top seafood destination. The New Year’s Eve celebration at Blue Water will be similar to CinCin’s: late diners will enjoy a DJ, dance floor, a glass of bubbly and a special countdown for a $50. At West, you can enjoy festive seasonal dishes throughout December as part of a weekday lunch or a weekend brunch. Executive Chef Quang Dang has a special night planned for New Year’s Eve with a five-course tasting menu (wine pairings available). Araxi will be offering a festive lunch on Christmas Eve and Christmas Day. For NYE, you might want to consider celebrating at Araxi. A full gala celebration — including lively music and a midnight countdown — will help ring in the new year in the heart of Whistler Village. Bacchus is offering a Christmas Day Turkey Lunch, a Christmas Day Brunch and a Christmas Day Dinner (and how fabulous…a vegetarian option is available). This charming downtown hotel restaurant will also offer a New Year’s Eve Dinner (vegetarian menu available) and a New Year’s Day Brunch. At Alberni Street’s favourite steakhouse, choose from two festive lunch menus and three festive dinner menus in December. Dockside, situated on the water in Granville Island, will offer Christmas Day Brunch Buffet and a Christmas Day Dinner Buffet. On New Year’s Eve, enjoy their four-course dinner package. Francesco’s is offering three holiday lunch menus and four holiday dinner menus…Italian-style, of course. In the lobby of one of my favourite Vancouver hotels, the Loden, sits this stylish and central downtown oasis where you are sure to get into the holiday spirit. Choose between the Holly Jolly or White Christmas menus for lunch or the Deck the Halls and Winter Wonderland menus for dinner in December. Vegetarian options are available for all menus. Tableau will be open for lunch on the 24th but closed for dinner service on Christmas Eve and all day on Christmas Day. A reliable stop for exquisite, high-end Christmas desserts this December. 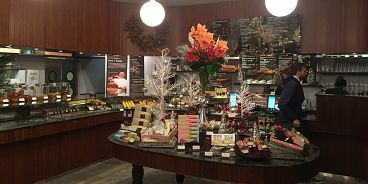 Chef Thierry will offer festive pastries, seasonal sippers and signature coffees (yes, they’re licensed). Open from 7am to midnight, Monday to Friday and 8 am to midnight, Saturday and Sunday, closed on Christmas Day. Celebrate the holidays buffet-style at this central Vancouver hotel; they’ll be open for dinner service on December 24th and 25th. And on Christmas day, they’ll offer holiday brunch. For New Year’s Eve, indulge in a five-course chef’s tasting menu ($65) with local wine pairings ($50). Seasons In the Park’s Christmas Eve and Christmas Day Menu will be available on December 19th, 20th and the 24th. This romantic, longstanding South Cambie eatery is also hosting a three-course New Year’s Eve Dinner for $45. The Roof Restaurant atop this historic Vancouver hotel will offer a festive lunch buffer on December 5th, 12th and 19th. On Christmas Eve, the Pacific Ballroom will see some dancing action, as well as a candy shop and a Christmas Eve dinner buffet. The following morning, guests can enjoy a Christmas brunch and a visit from Santa himself. Christmas Day Dinner Buffet will be available, as well. Located within the trees of our beautiful Stanley Park, this cozy restaurant (with comfortable seating) is offering a Christmas Eve Menu and a Christmas Day Menu. Yew is always a great bet for Christmas-time dining. Located in the Four Seasons Hotel, this Ocean Wise seafood restaurant will serve three-course feasts on Christmas Eve and Christmas Day. Chef Ned Bell’s annual brunch buffet will include a slew of pastries, seafood, charcuterie and a special station for kids. Celebrate New Year’s Eve at Yew, as well — they’ll offer two New Year’s Eve Dinner seatings and then a New Year’s Day Brunch. We’re lucky to have countless excellent Chinese Restaurants at our fingertips here in Vancouver. Consider one of these restaurants for Christmas Dinner, or perhaps even a Christmas morning Dim Sum feast.